They make all of their sauces from scratch in small batches here in WA. This is a truly unique habanero hot sauce, made with roasted garlic, caramelized onions, and a special blend of vinegar. 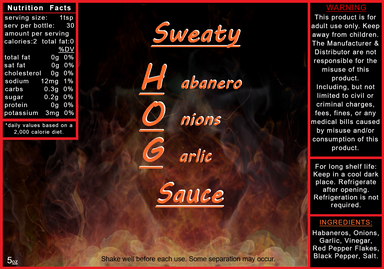 Hogs founder, Rob has been making this sauce for over 6 years. It has a medium to medium-high heat level. This sauce has great flavor, and the heat will not burn you too long. It is great on all types of food and can be used in marinades, and dipping sauces to give them a little kick. Made with all the ingredients as sweaty hog sauce, but added just the right amount of ghost peppers to it to pick the heat up but not make it so hot it ruins your food. This sauce is not for people who can't stand a little burn.